The Bosch DDS183-01 Drill/Driver Kit has a drill with KickBack Control, which reduces the risk of sudden tool reactions in binding conditions. This integrated acceleration sensor automatically shuts the tool down when a potentially dangerous rotational torque reaction occurs in a bind-up scenario. It is engineered with an upgraded, heavy-duty all-metal chuck that allows for increased robustness and great torque transfer. With an efficient EC Brushless motor, this drill/driver provides longer tool life as well as great runtime. It delivers a powerful performance, with 531 In.-Lbs. of torque, two drilling speeds (0-1,900 rpm for high speed and 0-600 rpm for torque) and 20+1 clutch settings. This tool provides Electronic Motor Protection and Electronic Cell Protection to protect the tool and batteries from overload and overheating. The kit includes two 18V 4.0 Ah FatPack batteries and a charger, to deliver all-day power, and a long belt clip for a secure hold. Lightweight and fast, the DeWalt High Speed VSR Drywall Scrugun is ideal for fastening drywall to wood and light-gauge metal studs. It can also be used for steel stud framing up to 20-gauge. It features a depth-sensitive set and forget nosepiece for consistent fastener depth. The two-finger rubber trigger offers increased comfort for all-day work. The D25831K 13 lb. Spline Demolition Hammer is a high-performance chipping hammer powered by 13.5 amp motor. The dependable and hard hitting German engineered mechanism, delivers 8 joules of impact energy. With Constant Speed Under Load electronics, the D25831K is ideally suited for work on concrete and masonry walls, floor and wall channeling, and removing plaster and tile from floors, walls and ceilings. Variable speed dial allows you to reduce power for better performance in brittle substrate materials. The Active Vibration Control&reg; technology employed delivers reduced user vibration for less user fatigue and greater productivity. Legendary in its class, DeWALT's drywall drills have proven themselves time and time again as the preferred choice for drywallers. This 4,000 rpm VSR Drywall Scrugun from DeWALT features a metal gear housing for increased durability; a depth sensitive "set and forget" nosepiece for consistent fastener depth; rubber grip and two-finger trigger for increased comfort, and helical-cut steel, heat-treated steel gears for long life and durability. Lightweight with excellent ergonomics for all your drywall tasks. 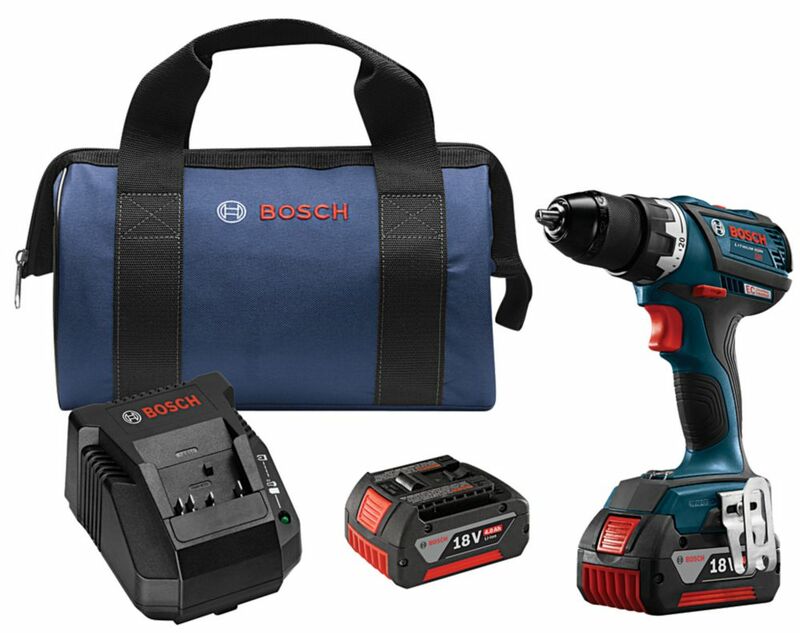 18V EC Brushless Compact Tough 1/2 Inch Drill/Driver Kit The Bosch DDS183-01 Drill/Driver Kit has a drill with KickBack Control, which reduces the risk of sudden tool reactions in binding conditions. This integrated acceleration sensor automatically shuts the tool down when a potentially dangerous rotational torque reaction occurs in a bind-up scenario. It is engineered with an upgraded, heavy-duty all-metal chuck that allows for increased robustness and great torque transfer. With an efficient EC Brushless motor, this drill/driver provides longer tool life as well as great runtime. It delivers a powerful performance, with 531 In.-Lbs. of torque, two drilling speeds (0-1,900 rpm for high speed and 0-600 rpm for torque) and 20+1 clutch settings. This tool provides Electronic Motor Protection and Electronic Cell Protection to protect the tool and batteries from overload and overheating. The kit includes two 18V 4.0 Ah FatPack batteries and a charger, to deliver all-day power, and a long belt clip for a secure hold. 18V EC Brushless Compact Tough 1/2 Inch Drill/Driver Kit is rated 3.0 out of 5 by 2. Rated 5 out of 5 by dwc309 from This is a great product after several uses. Batteries are great, balance is very good. chuck wo... This is a great product after several uses. Batteries are great, balance is very good. chuck works well, and the controls are convenient and easy to use. I was a little disappointed with the bag as it has no compartments but I already had a bag for my previous black and decker cordless drill which this unit replaces. The black and decker has worked well for the 10-15 years that I've had it. I bought this unit because of the excellent other light Bosch cordless drill that I have. The batteries on the older unit have been great as I still have the originals of them for greater than 10-15 years as well.